The 1215cc 3-cylinder shaft drive Trophy SE* gives you the torque, performance and handling for a sublime riding experience. With the Trophy SE, electronically adjustable suspension and a sophisticated audio system comes as standard. Whatever the distance, you’ll cover it in style and comfort; the generous, luxury seats and ergonomically designed riding position mean the miles melt away barely noticed. Price Per Day in US Dollars. *GPS requires additional $50 deposit. 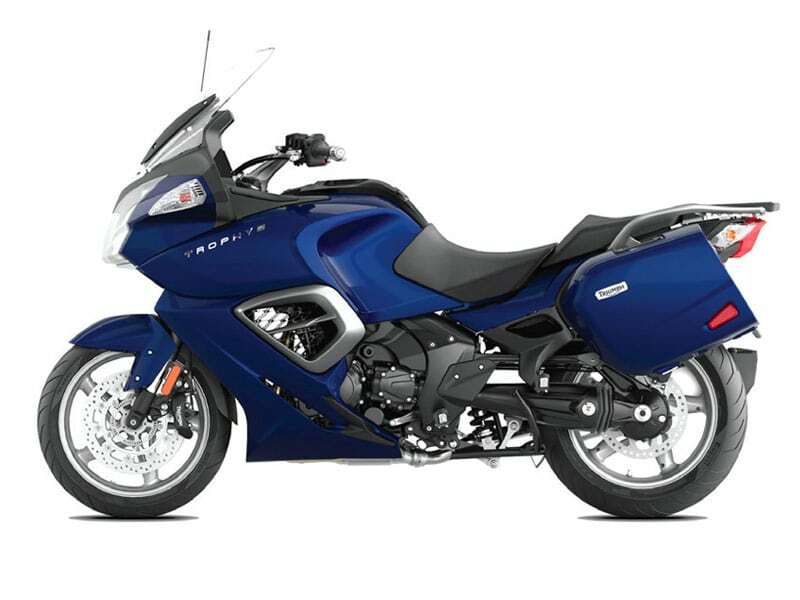 RESERVATION DEPOSIT: A Reservation deposit is required to reserve the motorcycle. A $50 deposit will be charge to your credit card at the time of reservation. DAMAGE DEPOSIT: A $2500 security damage deposit on a credit card is required to cover the cost of damages to the motorcycle. Motorcycle renter must be the cardholder. The deposit can be reduced to $1500 by accepting the CDW II and is returned in full when no accident occurred and the undamaged motorcycle is returned. CANCELLATION and REFUNDS: Your $50 reservation deposit will be refunded if reservation is cancelled 7 days prior to your reservation pickup date. Reservation: Advance reservation is required, see our reservation form. We confirm reservations three days prior to pick up time. Drop-off hours: Monday through Saturday from 9 a.m. to 6 p.m. Sunday from 10 a.m. to 5 p.m. Requirements and deposit: Our insurance requires that motorcycle renters be at least 21 years old, and have a valid motorcycle license. A refundable $2500 deposit, made on a credit card, is required when signing for the motorcycle. By accepting the CDW II, this deposit is lowered to $1500. All passengers need to sign a Release of Liability before they are allowed on the motorcycle. Rates are quoted in US dollars. Rates do not include current Nevada sales tax. THE NEW TRIUMPH TROPHY Designed with obsessive attention to detail, the 1215cc 3-cylinder shaft drive Trophy gives you the torque, performance and handling for a sublime riding experience. The Trophy SE comes with the addition of electronically adjustable suspension and a sophisticated audio system. THE POWER OF THREE. Fine-tuned for the smoothest ride possible, the thrilling 1215cc three cylinder engine gives you power and torque when you want it and exhilaration when you need it. The beating heart of the machine, this spirited engine delivers excitement on demand; no need to wait for the revs to rise or be forced to kick down a gear at the wrong time. You’ll feel it and you’ll hear it as the infamous Triumph Triple delivers it inimitable, spine tingling sound. Wherever you want to be, the triple puts you there – giving you total control and the confidence to ride to your full potential. The 134PS, 1215cc three-cylinder engine pumps out 120Nm of torque , which spreads the power throughout the rev range giving you effortless acceleration and smooth cruising. Ride-by-wire electronic throttle system, clear, easy to use control panel and, on the Trophy SE, electronically adjustable suspension, makes it simple to set and make adjustments to suit your exact preferences. So no matter how far you travel, you’ll go the distance confidently and comfortably. On the Trophy, you’ll never hesitate to ride past the last streetlight on the edge of town. The Trophy SE’s superb audio system immerses both you and your passenger in sound. Bluetooth and iPod technology connects you to radio, music and phone. With optional thermostatically controlled heated seats and grips, whatever the weather, wherever you’re going, both you and your passenger will ride in comfort. The Trophy’s windscreen isn’t just designed to protect you from wind and rain at all speeds. It’s cleverer than that; it actually remembers its last position. So, when you start the bike, you don’t have to waste time readjusting it. Even the mirrors and foot positions have been intelligently designed to protect your hands and feet, keeping them dry and comfortable. However much luggage you take with you, it will feel as if you’re travelling light. Triumph’s dynamic luggage system allows a small amount of independent movement which increases stability and doesn’t compromise the chassis’ dynamic performance.